He would eat keto during the week and eat whatever he wanted during the weekend, including his home-brewed beers. This compromise seemed to work at first until he realized that now he felt sluggish and had gastric problems on the weekends — a far-cry from how much better he felt during the week. So, he took the next logical step: he put down the beer and went full keto, 7 days a week. Craig and Maria went on to write one of the most comprehensive books about the ketogenic diet — Keto. — and began creating online courses for other people looking to improve their own health through a ketogenic diet. 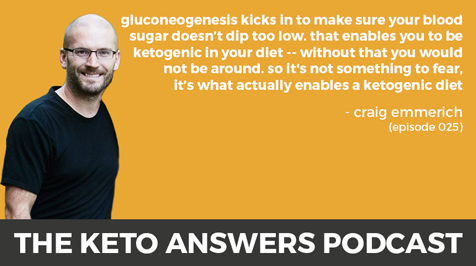 Throughout the years, Craig has learned what works and what doesn’t on keto, what is hype and what is evidence-based, common misconceptions about keto, and how to formulate your ketogenic diet to get the results you want. Craig Emmerich now runs the website Maria Mind Body Health and Keto Adapted with his wife Maria, and he’s an author, entrepreneur, and keto expert. In this episode, he explains how to succeed at one of the most common goals people have when starting a ketogenic diet: weight loss. Craig explains why this happens, how to prevent weight loss plateaus, how to make keto healthy, and the specific steps you can take to make your body burn off stored fat, not just dietary fat. He also breaks down common keto myths that keep people from enjoying a healthy and fulfilling ketogenic diet. If you’ve ever wondered how to eat at a calorie deficit — as low as 800 calories per day — and feel completely satisfied with no cravings or hunger pangs, here are all your answers. Diet vs exercise: which matters most for weight loss? What is a protein-modified fast?